Purpose: Introductory meeting with high school staff to provide motivation toward character education and introduce a new character education curriculum. Led by the local Character Education Supervisor. Let’s imagine for a moment that we’re all Math teachers – excellent Math teachers. We take our jobs seriously, so that we eat/drink/sleep teaching Math. Let’s imagine further that a large portion of our students are not only excelling at Math, but one catches fire for Math, excelling to such an extent that he skips two grades, graduates from Harvard, winning a prize for his doctoral thesis, and lands a job teaching Math at the prestigious University of California, Berkeley. I’d feel pretty successful. Wouldn’t you? I just might put his picture up on my desk, as an example of where disciplined learning can lead. Now I’m definitely not laying the blame for Kaczynski’s murders at the feet of his teachers. If we’d taught him, I don’t know if we could have turned him around or not. But his story does clearly warn me that if we only teach academics, we may find ourselves merely educating smarter criminals, equipping them to be more successful in leading future Enrons to steal our life savings, or even taking others’ lives. I suppose I’m trying to convince the already convinced here. But we can always use more motivation. What are some reasons you think it’s important to try to positively impact the character of our students? We’re all doing character education anyway, whenever we set class rules, discipline procedures, in how we treat students, etc. If we’re doing it anyway, why not learn to do it well? Many of us become teachers because of the impact of one or more great teachers. These often did more than transfer knowledge. They often cared about us. Without character, our schools aren’t safe. None of us want to teach selfish, rowdy, ungrateful, undisciplined, prejudiced students. How can we encourage them the right direction? First of all, character education experts encourage us to promote character in the way we conduct our classrooms. If we treat our students fairly and show compassion, we model positive character for them. Second, we can find ways to incorporate it into our curriculum. Rather than just learning the facts about Benjamin Franklin, why not go further and explore some of the character traits that made him successful? Secondly, it often helps to set aside a few minutes regularly to reflect on a particular trait. That’s why we as a school emphasize a certain trait every month. Problem is, we’re all so busy, that it’s hard to put together compelling materials. Who has the time to research motivating stories and discussions for each character trait? It’s written for teens, appealing to them with its stories and discussions. It offers full lesson plans, but also additional quotes, discussions, activities and stories to use in making each lesson more appealing to your students. I especially like the “Intercom Insights,” which are short, 2-minute people stories, which we can share with the class, or have a student read to the class, followed by discussion questions. It’s all available online, so that all teachers can access the materials on the site. We can either print what we want as is, or download it into a word processing document to adapt it as we want. We can all try it out free of charge and I’d love to get your input, positive or negative. 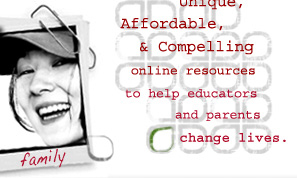 The site is www.character-education.info and your codes to get in are your username and password.